An ongoing international effort to help African nations improve maritime safety and security in the Gulf of Guinea represents one of U.S. Africa Command’s most successful programs while embodying the command’s core principles, according to Africom’s director of strategy, plans and programmes. Army Major General Charles Hooper called Africa Partnership Station — an initiative that has grown over the past five years to include more than 30 African, European and North and South American countries — a model of international and interagency cooperation. 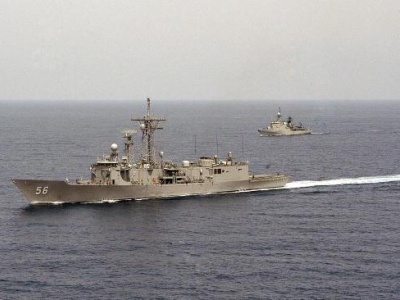 Participants are working together to develop capacity among countries along the Gulf of Guinea so they can control their territorial waters and crack down on illicit trafficking and other criminal activity, the American Forces Press Service reports. And what happens at sea matters, not just for Africa, but for the entire world that depends on access to the global commons, Hooper said. He noted the direct link between maritime security, development, prosperity, stability and peace. “It involves the interagency team, engaging in teaching, coaching, mentoring and building the capacity of our African partners to solve their own problems,” he said. This directly supports President Barack Obama’s Africa policy and the recognition that has guided Africom since its inception in 2008, he noted. “It is our African partners who are best equipped and best pointed to address African challenges,” Hooper said. This year’s engagement, the largest yet, kicked off with its first port visit in February in Lagos, Nigeria, and continues through September. The guided missile frigate USS Simpson launched this year’s training programme in Lagos, with the crew working with sailors and coast guardsmen from 12 African nations in the first leg of training events. The high-speed vessel Swift began visiting Africa this spring. Later this summer, USS Fort McHenry will join the Africa Partnership Station mission. Training events throughout the programme, both ashore and at sea, are being tailored to help African maritime nations improve their own capabilities while strengthening their relationships with partner nations. This, officials said, promotes regional cooperation to address common threats, such as piracy and illicit trafficking, and in promoting energy and resource security. “By working together, African navies and coast guards are able to bring maritime safety and security, which will help secure their future,” said Navy Chief Warrant Officer Eve McAnallen, the Africa Partnership Station training officer. Commodore Andrew Dacosta, director of training for the Nigerian Navy who helped to plan this year’s mission, said African Partnership Station underscores the importance of that effort. “APS has helped us realize the needs for collaboration, cooperation for the collective security of the maritime environment,” he said. Gabonese Chief Petty Officer Pierre Mboulou welcomed the opportunity to participate in this year’s training. Most recently, representatives from the US Naval Surface Warfare Centre (NSWC) and Naval Sea Systems Centre hosted a Maritime Environmental Conference and workshop that concluded yesterday aboard Swift as part of the ship’s participation in Africa Partnership Station East. Thirteen members of the Tanzanian People’s Defence Force, as well as local police and port security officials graduated from the two-day workshop, learning about management of hazardous waste and oil spills as well as incident response plans. “The goal is to give them some of the lessons we’ve already gone through in the U.S. on how to deal with the environment, pollution, solid waste and what the Navy is doing and what they may have an opportunity to do here,” said Tom Luchay, chemical engineer with NSWC. Participants explored specific case studies stemming from oil spills and other threats to the environment that took place in the United States. The discussion expanded to how these events can harm the marine ecosystem and filter to harm humans and the food chain. Further discussion during the workshop centered on environmental policy, laws and regulations and how to stop pollution hazards before they happen. The instructors have participated in several APS sessions and say that each African country they’ve visited has unique concerns when it comes to the environment. “Our first visit was to Sierra Leone back in February, and in that country their issue is infrastructure, roads, power and water distribution. Here, in Tanzania, they seem to have pretty well established laws and regulations but deal with issues coming from heavy industry,” said Luchay. Before receiving certificates and departing Swift, participants discussed emergency incident management and planning measures. The greatest lesson learned from that talk was how agencies that practice their plans and communicate together can keep an environmental hazard from getting out of control. During this exercise participants discussed the importance of spill preparedness, identified potential spill impacts, learned spill planning and gained knowledge on response requirements.